Gender Matters presents a feminist linguistic analysis of texts – literature, media and lyrics – and conversation. It explores how gender relates to and shapes our understanding of sexism, reading and writing, politeness and public speaking. The essays in the book examine a range of questions: why is it necessary for feminists to analyse or comment on sexism when sexism is widely regarded as an anachronistic concern? How can feminists describe the effect of gender on the experience of literature? Why are women considered more capable of private rather than public speech? What is the relation between gender and politeness and are women more polite than men? In analysing these themes, Gender Matters highlights the insights and strengths of both second and third wave feminist analysis for linguistics. 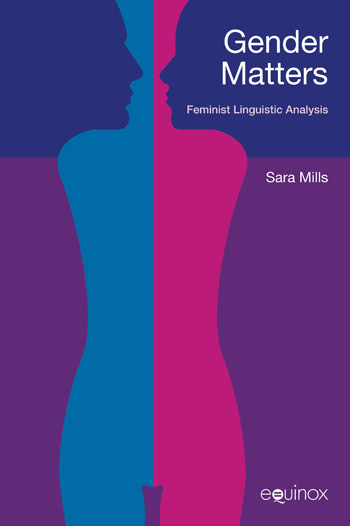 Sara Mills is one of the pre-eminent contemporary feminist linguists, and this volume allows the reader to appreciate the breadth and depth of topics and range of methods she has employed in her work over a quarter of a century of scholarship. This book is a good reference for faculty and students in the field of language and gender and for anyone interested in the relation between language and gender. Gender Matters is a useful survey of some of the key debates in feminist linguistics that will be of interest to students of both linguistics and literary studies, and is a refreshing alternative to the traditional ‘dominance; difference; dynamic/diversity’ themes usually imposed on accounts of language and gender research.